Turkey’s “grandeur and patience” prevented it from going to war with Israel over last year’s flotilla clash, according to Erdogan. Turkey’s “grandeur and patience” prevented it from going to war with Israel over last year’s flotilla clash, Prime Minister Recep Tayyip Erdogan told Al Jazeera. In blatantly pompous remarks, Erdogan insisted that the IDF’s actions were illegal because the Navy commandos acted in international waters, but his claims clash with findings of the Palmer Report, issued under the auspices of the United Nations. The report said that Israel’s maritime blockade against Hamas-controlled Gaza is legal. It criticized the IDF’s actions as “excessive” but did not say they were illegal. Erdogan said the clash was “a cause for war, but we decided to act in line with Turkey's grandeur and showed patience." By all accounts, Turkish citizens from the IHH organization, which has been officially linked with terrorist activities, boarded the Mavi Marmara ship in Turkey without any humanitarian aid for Gaza. 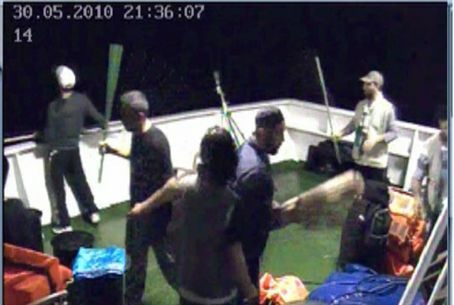 Erdogan accused Israel of “attacking” the terror activists aboard, but video evidence has shown that the IHH members were armed with iron clubs, chains and knives and had trained to attack the commandos as they reached deck after sliding down a rope from a hovering helicopter. Three of the commandos were kidnapped and seriously wounded before the navy soldiers were able to take control of the ship, killing nine IHH attackers and wounding others. Erdogan’s statements came at a time when Israel and the United States have been trying to tone down the diplomatic crisis that deepened with the release of the Palmer Report. Turkey immediately recalled its ambassador to Israel and reduced diplomatic ties to a tertiary level. Erdogan also said he would send warships to the Mediterranean Sea to protect Turkish vessels and is suspending all trade with Israel. However, he later backtracked, saying that only trade with government agencies would be affected by sanctions. Concerning the warships, he said his remarks were mistranslated. Nevertheless, he declared on Sunday that naval patrols will be increased as international consortiums, including Israeli participation, drill for oil and gas off the northern Mediterranean Coast.